One of the five bright planets visible to the unaided eye, Mars has perplexed and tantalized stargazers since antiquity. Its ochre hue, a consequence of iron-oxide in its surface sands, prompted classical astronomers to name the planet after the Roman god of war, and its dark and changing surface markings inspired early telescopic astronomers to speculate about the presence of life on the planet. The coming weeks offer you the best chance in the next two years to see Mars with a small telescope, so here's a guide to help you get a good view of the Red Planet in 2016. 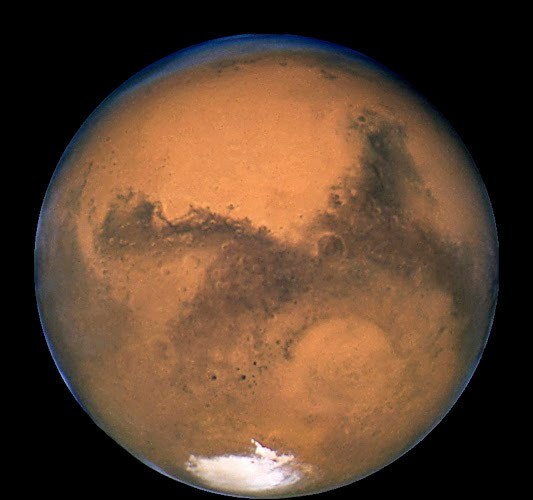 Fig 1: Mars imaged by the Hubble Space Telescope during its opposition of 2003. Photo credit: NASA/HST. Mars is usually a small and disappointing sight in a small telescope. But once every 780 days, or about two years and two months, Earth catches up to Mars in its orbit and makes a close approach when both planets are on the same side of the Sun. Mars then appears in our skies directly opposite the Sun, rising in the east as the Sun sets in the west. This alignment, when Mars is closest to Earth and appears largest, is called an opposition. This year Mars reaches opposition on May 22, 2016. The several weeks before and after opposition, called an apparition, are the best time to see the planet. Because of Mars' elliptical orbit, not all oppositions are equal. During the famous opposition of 2003, when Earth and Mars were just 34.7 million miles apart, the disk of the planet grew to a diameter of 25", the largest Mars has appeared from Earth in 60,000 years. During the opposition of 2012, on the other hand, Mars never got closer than 62 million miles and appeared just 13.9" across. At this year's opposition, the planet comes with 46.5 million miles of Earth and spans about 18.6". That's a respectable opposition and the best since 2005, but even at its closest this year, Mars appears just 1/3 the size of Jupiter at its opposition in March 2016. Fig 2: The location of Mars at opposition on May 22, 2016, looking southeast a few hours after sunset as seen from the northern hemisphere. The planet straddles the border between the constellations Scorpius and Libra. From the southern hemisphere, Mars and the grand constellation Scorpius are directly overhead in the late evening hours. Created with SkySafari. You can't miss the planet during this apparition. 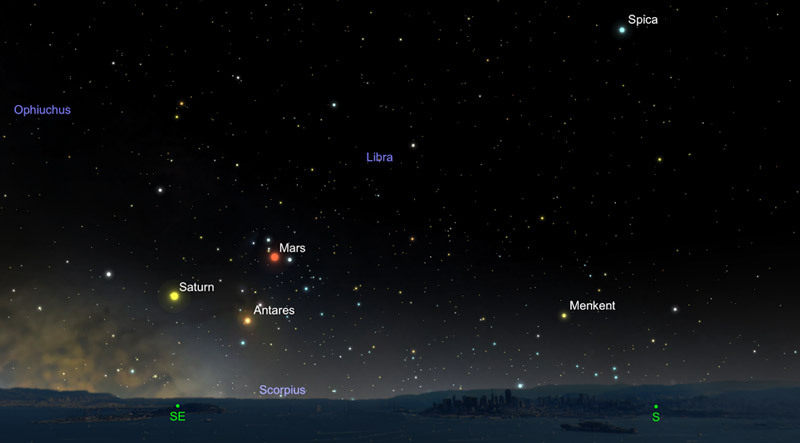 With an unmistakable red-orange light, Mars will reach magnitude -2.1 at opposition, far brighter than any star and about the same brightness as the planet Jupiter, which lies low in the western sky in late May and early June Mars will far outshine even Antares, the brilliant red supergiant star at the heart of the constellation. Antares name derives from the Greek ant Ares, which means "equal to Ares", the Greek name for the god Mars. From August 22-27, 2016, when Mars is well past opposition but still brilliant, the planet will pass within just 2° of fainter Antares. What's the best telescope to use to see Mars? The one you already have, of course. Telescopes with longer-focal lengths give you higher magnification and larger images with a given eyepiece. Refractors, which have no central obstructions, tend to give better contrast. But larger aperture Newtonian reflectors or Schmidt-Cassegrain telescopes can give better resolution of fine detail because of their larger apertures and longer focal lengths. 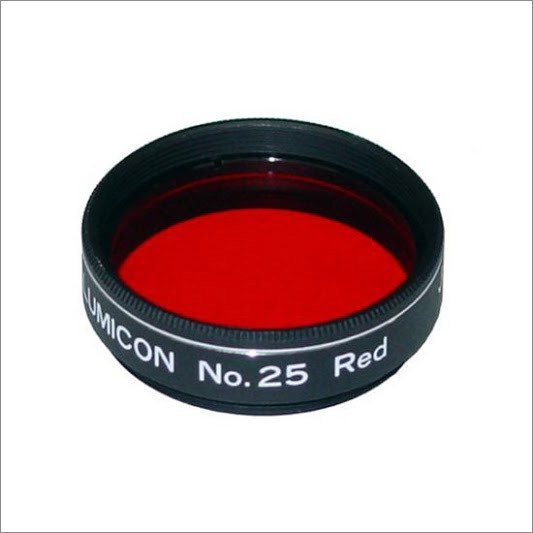 If you have a small, short-focal-length scope you may want to your shortest focal-length eyepieces or a Barlow lens to get higher magnifications. You need to use a magnification of at least 150x to get a decent view of Mars. This magnification will make the planet look just a little larger than the full Moon appears to your unaided eye. Work your way higher if your equipment and seeing conditions allow, up to a maximum magnification of 50x-60x the aperture of your telescope (in inches). The optimum magnification may change from night to night as seeing conditions change. Fig 3: Look at this image from about 10 feet away to see Mars as it might appear in a small telescope in good seeing. Photo credit: faulkes-telescope.com. As for eyepieces, again, use what you have. The best eyepieces for observing planets have simple designs with fewer optical elements and a moderate field of view. You don't need $400+ eyepieces to see planets. A good-quality Plossl or Orthoscopic eyepiece will do just fine. Acclimatize Your Telescope. Bring your scope out at least 30-60 minutes before you plan to observe. By cooling it down to the ambient temperature, you'll prevent air currents inside your scope from degrading the image of the planet. Pick a Night With Steady Air. Seeing is critical when observing Mars. So pick a night when the air is steady and the stars aren't twinkling too much. Vigorously twinkling stars mean poor seeing, even if the sky is clear. Sometimes, nights with a little haze have steadier air than nights of greater clarity. Observe Frequently. Because Mars rotates every 24 hours and 37 minutes, you'll see almost the same face of the planet at the same time each night. So extend your sessions over several hours on one night, or at the same time over the course of a month to see both sides of the planet. Fig 4: A #25 Wratten filter threaded for a 1.25" eyepiece: an essential filter for observing Mars. Photo credit: Agena AstroProducts. Magenta (#30, #32) will enhance red and blue features and darken green ones, and may improve polar features and some Martian clouds. Also, to be frank, you need to manage your expectations. No matter how big your scope, Mars won't look anything like images you see the magazines or astronomy websites. In a small telescope, Mars looks tiny and gives up little detail at a glance. Astronomy writer Timothy Ferris wrote of observing the planet, "Observing Mars through a telescope is like watching the Dance of the Seven Veils - seldom are you certain of exactly what you've seen, but it's enough to pique your interest." The most important tool for observing Mars is patience. Even on Mars' small disk, you can see an astonishing amount of detail if you look carefully, on and off for long periods of time, and wait for fleeing moments of steady air. Fig 5: A full-surface map of Mars showing the major regions of the planet visible from Earth. Photo credit: Sky and Telescope. The darker regions were names after seas, lakes or other watery features. So there is the very large Mare Erythraeum (Arabian Sea) in the south, Mare Acidalium (named after a legendary fountain) in the north, and most strikingly, the large wedge-shaped feature Syrtis Major named after the Gulf of Sidra off the coast of Libya. Syrtis Major is the most obvious dark region on the Martian surface. Many of these dark regions appeared to early telescopic observers to change size during the Martian year. They suspected this was caused by changes in vegetation or rainfall. It turns out the dark regions do not change their dimensions, but instead occasionally are obscured by atmospheric dust. The imaginative 19th-century astronomer Percival Lowell noted the region called Solis Lacus (Lake of the Sun), just south of what we now know to be Valles Marineris, an enormous valley as long as the continential United States, seemed to wax and wane with the seasons. Lowell observed many (illusory) canals converging in this region and speculated it was the capital of the Martian civilization. Solis Lacus is a part of what's now called Solis Planum. Observers often remark that these dark regions appear green. They are not… they are grey-brown and simply appear green because of the contrast with the red-orange surroundings. This article is © AstronomyConnect 2016. All rights reserved.